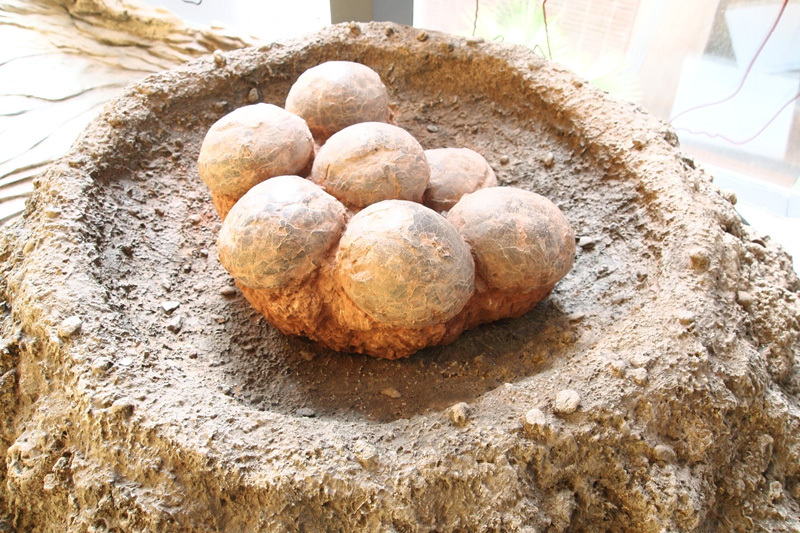 Dinosaurs reproduced through eggs laid on land, just like most modern reptiles and birds do. They clustered them in nests on the ground. Nests vary from simple pits dug into the earth to more complicated nests constructed with mud rims as shown here. Nests may appear in large groups or all alone. The nests and the clutches of eggs reveal information about the dinosaur's nurturing behavior. The spherical fossilized eggs on display were probably laid by a Jurassic Hadrosaurus, or duck-billed dinosaur, the most common plant-eating Ornithopod (bird-hipped) dinosaurs. They evolved in China during Upper Jurassic and Lower Cretaceous period, and by the Late Cretaceous period had spread to Europe and North America.